Gail Niebrugge (Knee-brew-ghe) born and raised in California has pursued art since childhood, winning a poster contest on the Johnny Jet television show at the age of twelve. Gail began her career as an illustrator for the US Navy and Marines in San Diego, and later established the Instructional Media Center for the Grossmont High School District in La Mesa, California. The Niebrugge family fell in love with Alaska while on vacation in 1976 and never returned home, instead they established a residence and studio in the remote interior settlement of Copper Center where the artist painted the wildlife, landscape, and contemporary way of life in the Copper River Basin. Since 1995 the Niebrugge’s work in their home and studio in Palmer, Alaska. Gail acquired her private pilots license in 1977 and flew her own Cessna 170B throughout Alaska’s isolated interior. Traveling by mail plane, ski plane, helicopter, boat, raft, ATV, canoe, truck and camper as well as hiking on foot, enables Gail to gain first-hand knowledge and understanding of Alaska’s wilderness, wildlife, landscape and history. Returning home to work in the studio her love of these subjects is translated into colorful paintings. Known throughout the world for her use of pointillism, the artist developed this technique in 1986 while confined to bed recovering from neck and back injuries. Using small dot like strokes the paintings are made from thousands of spots of color. Up close the dots dominate, but when viewed from a distance the image is sharply realistic. Gail received a Master’s Degree in Art Illustration from Syracuse University, received Alaska’s highest honor in 2012 Governor’s Award for the Arts as Individual Artist, is a signature member and Juror’s Award at Watercolor USA Honor Society at the Springfield Art Museum, Springfield MO, accepted into the New York Society of Illustrators, received Watercolor Award at the 22nd All Alaska Juried Exhibition, Anchorage Museum, served as artist-in-residence for the Wrangell-St. Elias National Park and Denali National Park, commissioned for the 2006 Alaska Governor’s inaugural poster, and is author of Gail Niebrugge’s Alaska Wildflowers a book about her work. A five time winner in the National Diabetes Association’s Holiday Art Search, Niebrugge’s artwork has appeared on hundreds of thousands of Christmas cards sold nationwide to benefit diabetes research. 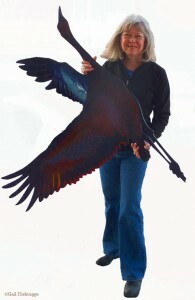 She has completed sixteen major public commissions in Alaska, including a ten panel multi-dimensional artwork for the US Art-in-Architecture Programs at the U.S. Customs in Skagway, and “Seven Sandhills Soaring” a seven panel installation of Sandhill Cranes in the entry lobby of the Palmer Courthouse. 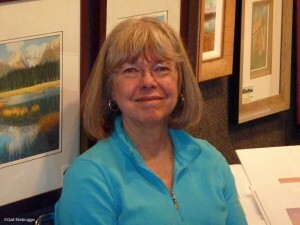 Gail has participated in more than 200 shows and exhibits including the Top 100 Arts for the Parks, Jackson, WY, the Vancouver International Wildlife Art Exposition, Vancouver, BC, and five times participated in the Annual Pacific Rim Wildlife Exhibition, Tacoma, WA. In demand as a speaker for the Alaska State Council on the Arts, Gail was appointed by two Alaska governors as Vice Chairman of the board of directors where she served from 2007-2011, was the Keynote Speaker for Prince William Sound Community College Commencement, Valdez, Alaska, where she served on the Accreditation Advisory Board and adjunct faculty. Her community service includes the Glennallen Council on the Arts, the founding board for the Greater Copper Valley Chamber of Commerce where she wrote grants to establish the first Visitor Information Center in Glennallen, Alaska, and as a public adviser for the land selection and development of the Wrangell-St. Elias National Park Visitor Information Center, Copper Center, Alaska. From 1977-1994 she was co-owner of the Glennallen Tastee Freez where the dining room hosted monthly art shows including exhibits from the Alaska State Museum. Niebrugge Studio, the family operated business, has published more than 185 editions of prints from her paintings available at galleries throughout Alaska. Cards, bookmarks, luggage tags, magnets, note pads and other products utilizing Gail’s images are distributed by Taku Graphics, Juneau, Alaska.